I found this beautiful white greek key bedding which is so simple with the trim. In my opinion, I don't think this bedding is either feminine or masculine, it's just perfect and makes us both happy! 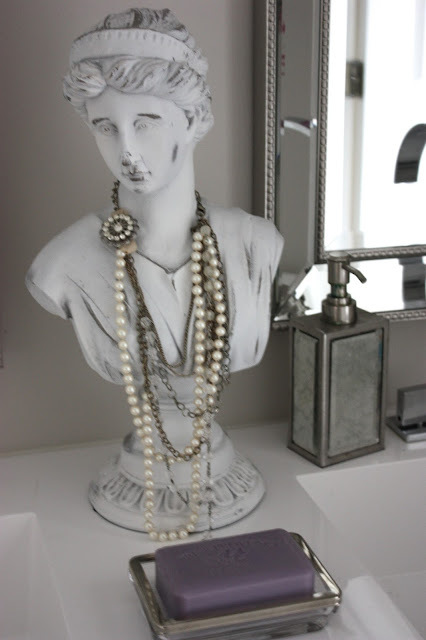 I style my nightstand with pretty pieces such as an antique perfume bottle and a room spray (current one is lavender for the Spring/Summer), also helps with sleeping. The one thing we both wanted was a streamline headboard and this one was the perfect height and what I love about it is the nailhead trim. This boarder gives the space a dramatic look but not over the top. We went with a light linen fabric (easy to clean). We are very happy with the final outcome of our bedroom. The key to styling this space was wanting it to feel tranquil and relaxing and I think we achieved that. We had a very busy weekend with family & friends. Did a lot of running around trying to get our backyard ready for all our guests. We did run into a problem with opening our pool :( It was green and it still hasn't changed. My husband is doing everything needed with chemicals to get the pool to turn blue (crossing fingers). Aside from that, we managed to get a lot of planting done (yay)! To be honest, this is my husbands' area. He knows his plants and has a method. I try to assist but only get so far. I also used this process not only on my black & white cushions but my cream lounge chair cushions as well (no bleach spots)! *Comment below if you tried this and how it worked out for you. On Sunday, we had friends over. Since it was a small dinner party outdoors, I decided to use our outdoor dining plates (sometimes I get lazy & use paper plates). The patio table you see below is brand new because our other table broke after 20 years. This table is soooooo nice. We already had the chairs from our previous set so I prayed this new table matched and it did!! The one feature I love about this table is it extends, yes, extends from 78"-90". Rarely see this in an outdoor table. I am linking it down below because it is currently on SALE. Hope you have a great Memorial Day weekend, and THANK YOU to those who have served and are serving our country. This day is about you! Our bedroom is pretty neutral and I usually love the monochromatic look, however, now that Spring is here I found myself wanting a bit more color. I have played around with blues and soft greens in this room but I really wanted something bold. Usually when I am out in stores searching for something specific I never find it. I went to Homegoods many, many times and I just wasn't finding what I wanted. I took a trip to West Elm with my girls and we walked around for a while because honestly, I can live in that store. I just love everything! We were about to leave when my eye caught 2 pillows (kind of hidden) on a low shelf. I ran over (like I found a pot of gold or something) and there they were, the perfect pillows. These pillows didn't only offer color but they also have beautiful abstract art printed on a luxurious silk fabric. That was it!! I brought them back home and threw a coral throw which I already had and those 3 items really gave this bedroom life. It's the little things right? I have linked items below...Happy Shopping! This is my most recent project I designed. 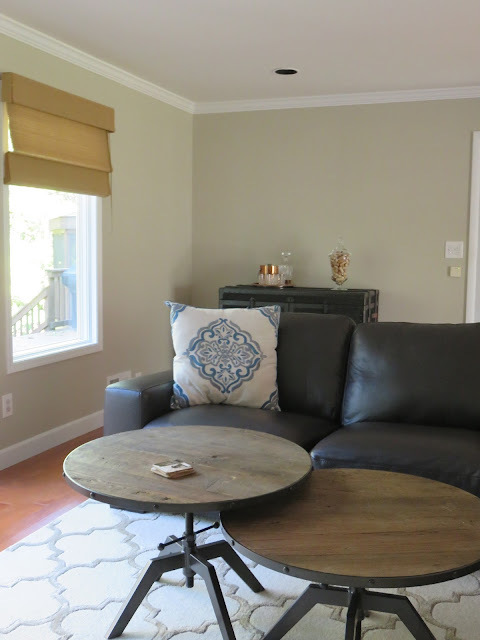 I met with my clients who wanted to transform their great room into a bright yet rustic style. What they had previously was an outdated and dark room. The only non-negotiable was keeping their current sofa sectional. The color of the sectional was a deep burgundy. As much as I wanted them to go lighter, the family agreed that this is something they didn't want to get rid of. I wanted to make sure since we were keeping their sofa that we made everything else in the room light and airy. The first area I tackled was the focal point of the room which was the fireplace. They had almost floor to ceiling mirrors above a non-existent mantle framed in brass. 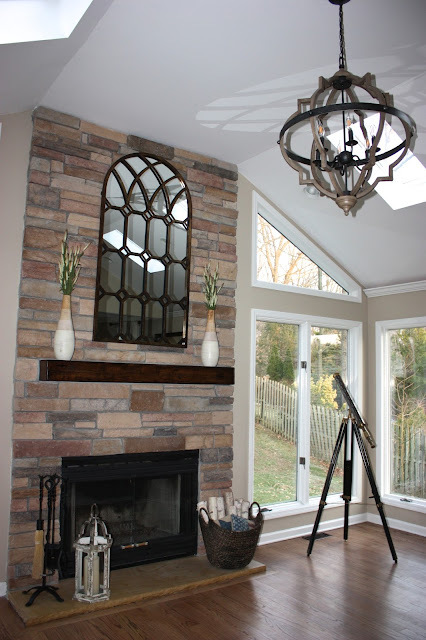 We decided on cultured stone in a variety of different shades to not only offer some interest to the wall, but also add texture. 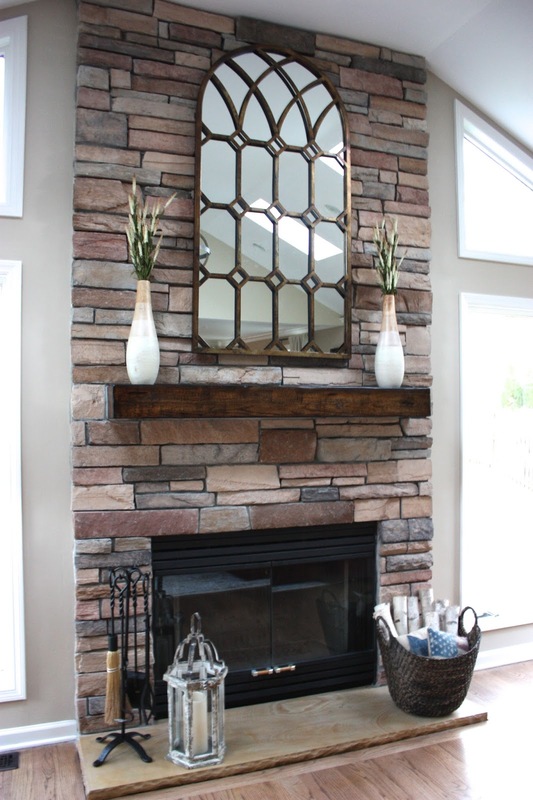 We also had a custom rustic mantle installed which brought in that rustic feel. The floors were once a rusty orange color which we had striped and stained to a light, walnut shade. Next up was paint. The walls previously were a yellow/green color. Since we were removing the majoprity of their window treatments, I wanted to go a creamy, beige color (BM Bleeker Beige). Today I sharing with you a project I did for a client this past year. My client had a 2 year old toddler. They just moved into their 1st home and they did not want a formal living room. They wanted to convert it into a play area for their son. 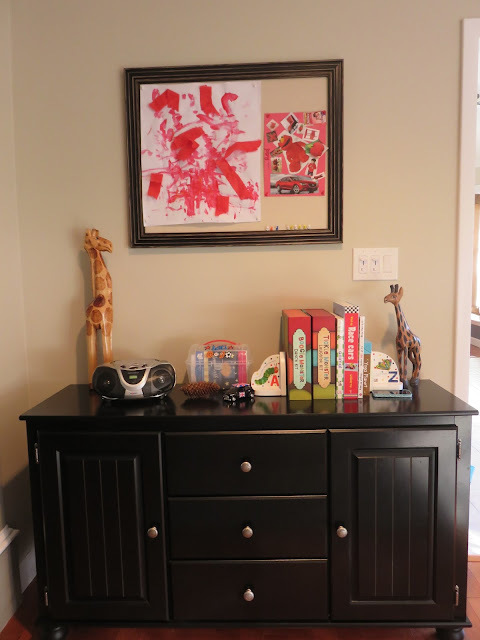 When designing a playroom, especially of it's the front room in your home, you want to try and create a functional, yet stylish space, not just toys thrown everywhere. They wanted to keep it minimal as far as furniture, however, they wanted to ensure they had plenty of storage to house all the toys. You will see in the playroom below how we achieved that. ws. I kept the paint also light to contrast with the dark, espresso sectional. Some artwork is still being delivered for over the bar area. 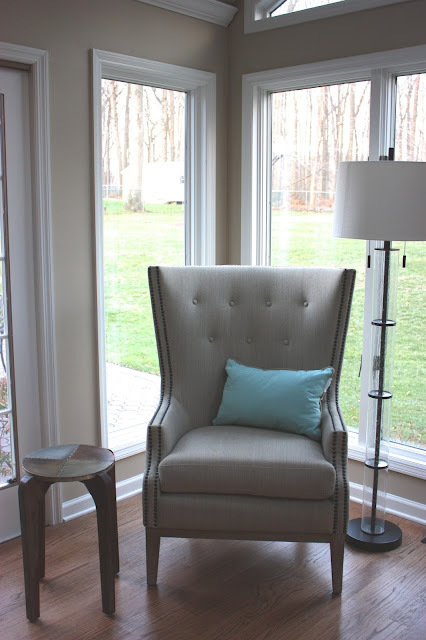 The family room offers the clients a space where they can entertain family and friends while still being able to keep an eye on their son in next room. This is my daughter's bedroom which was once all pink! When she tuned 12, she asked to make her room more "grown up". I was hesitant at first because that meant to me that she actually was growing up (insert sad face). I treated my daughter like one of my client's to get the style and design of the look she wanted to achieve. She explained to me that she wanted it to be glamorous but not too girly. I gave her some paint options since gray was the color she wanted to go with. We came up with "Sherwin Williams" Repose Gary. This shade is perfect. It doesn't have any blue or purple hues, just a true gray. Gray can sometimes be blah, so we incorporated pops of coral and teal green to give the room a cool, vibrant look. To achieve that "glam look", we purchased the Hayworth mirrored chest from Pier 1 Imports. It fit perfectly between both her windows. Another touch of glam came from the "Dreamer" sign above her bed. That sign is from PBteen (her favorite piece). 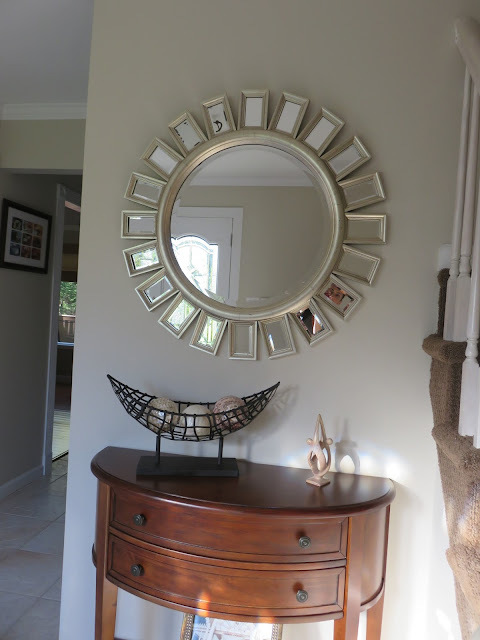 In addition to the mirrored pieces, we also brought in some gold with the polka dot pillows which we found at Homegoods and the fur stools with gold legs (also at Homegoods). Finally, for a whimsical feel, she wanted a tapestry for her wall. This wall is very big so we needed something large enough to fill it and this tapestry was the perfect fit. 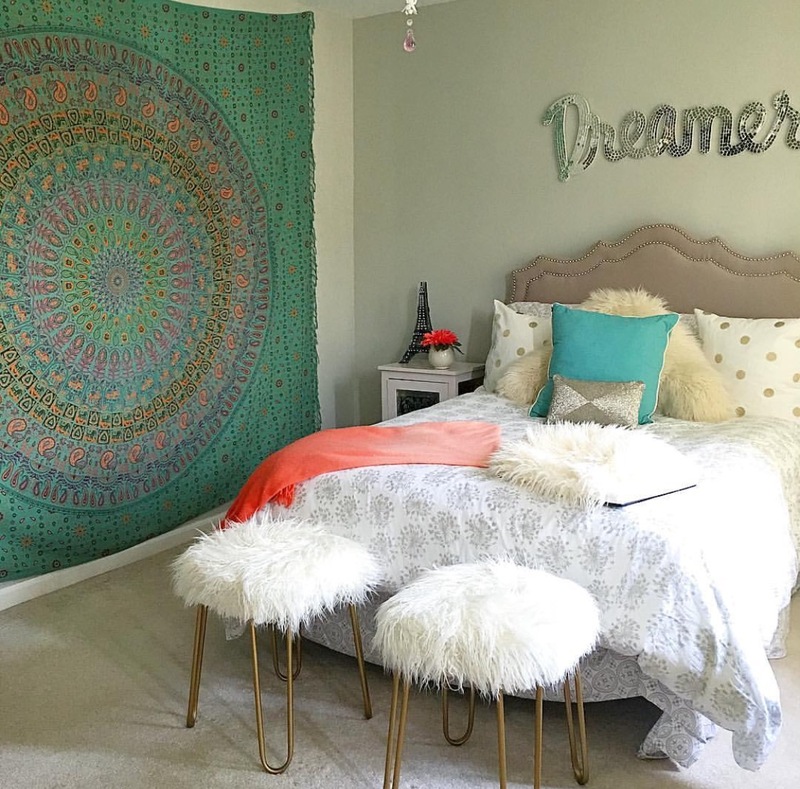 She was so happy with the final outcome of her room. I am so happy we got to work on this room together. 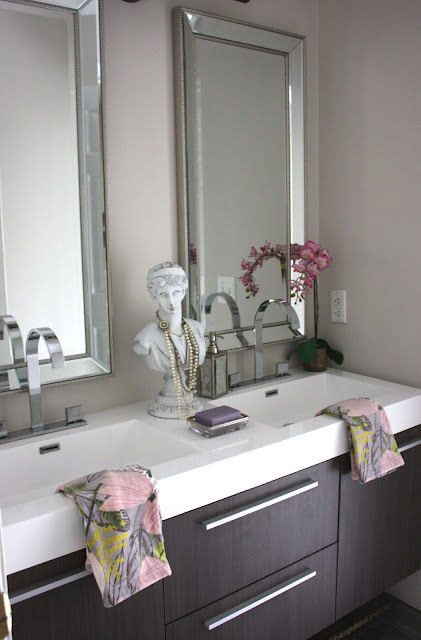 It gave her a sense of independency when choosing the design of the room. Such a fun project. Thanks for reading! Leave a comment below and let me know what you think. Before you throw your next party, browse a wide selection of bar ware, bar glassware and serving platters.